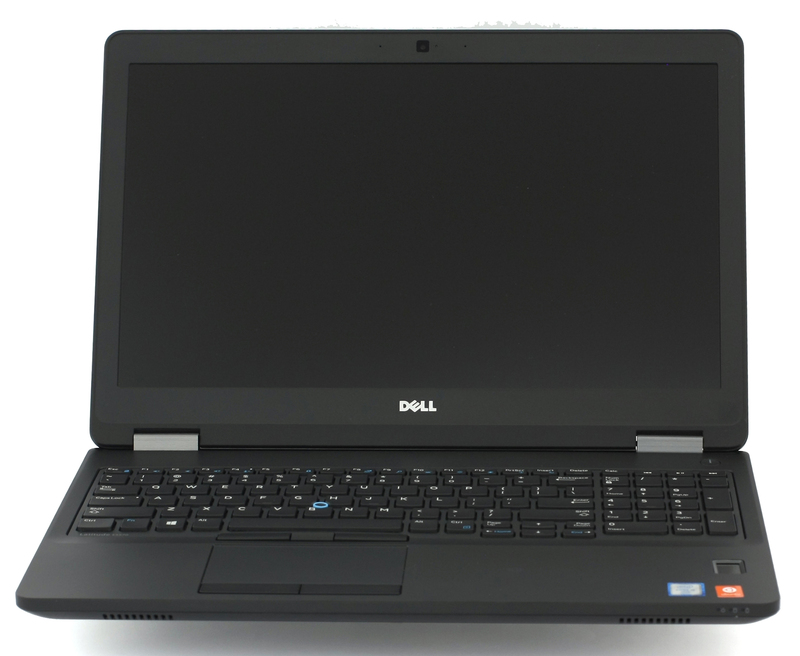 Dell’s refreshed Latitude lineup covers a big span of market segments but the E5570’s configurations are mostly considered as high-end, although some of the entry-level configurations are quite affordable, especially if you opt for the HDD variants. The last time we reviewed a Latitude E-series notebook was more than a year ago and we were left with a generally good impression. The build quality was excellent, input devices were comfortable and accurate while the battery life was more than satisfactory. This sums up all the important aspects of a business-centric machine and we think that the E5570 is an excellent successor to the E5550 we’ve reviewed last year. 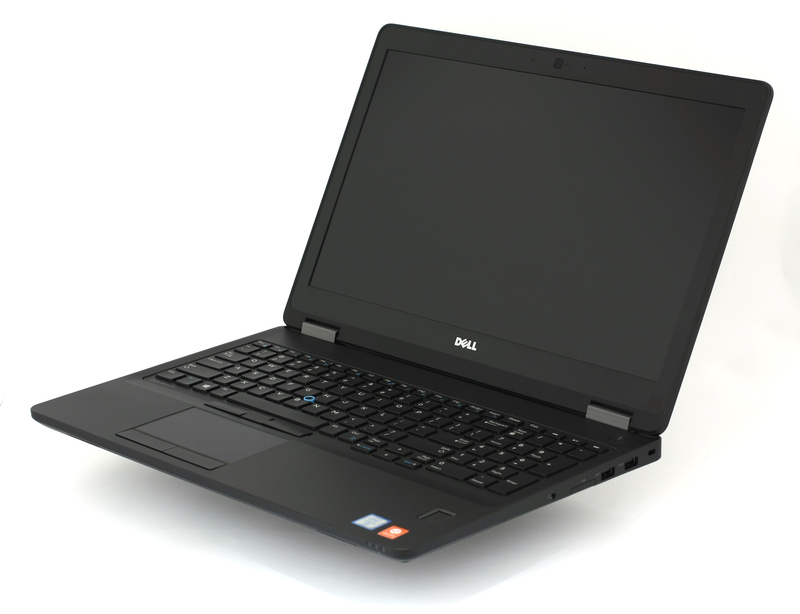 The upgrade focuses mainly on the hardware inside without any major changes in the design department nor did Dell add any new features. 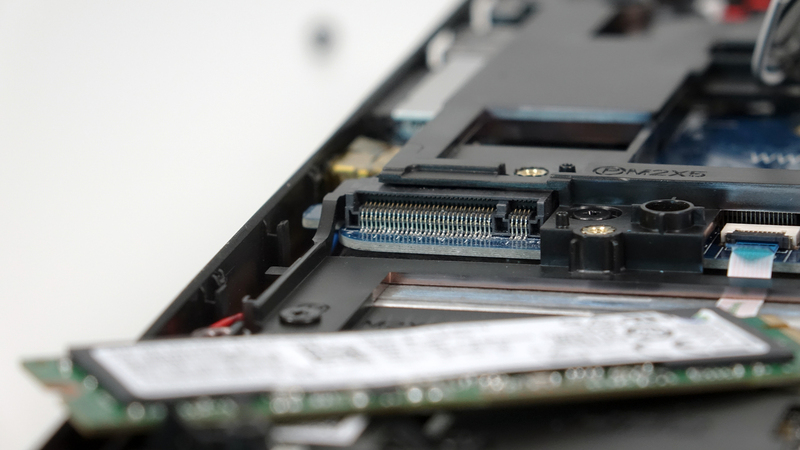 We were kind of surprised not to see the new USB-C connector coming with the Skylake upgrade but we can’t really say it’s a big drawback since the standard hasn’t been adopted by the market yet. Anyway, we are curious to see how the new Core i5-6300U will perform and how the 62Wh battery will play since it’s a decent upgrade over last year’s 51Wh unit. The notebook comes in a standard box containing all the usual user manuals, AC cord, charging adapter and the notebook itself. Nothing has been changed in general – the same plastic construction with soft-touch finish has been used for the interior and lid. The overall height has increased to 24.6 mm from 23.45 mm but the weight has gone down from 2.14 kg to 2.09 kg. Nothing that can be noticed easily, though. Interestingly, the lid feels a bit too bouncy for a notebook at this price range but doesn’t cause ripples on the LCD screen so it’s safe to assume that placing heavy objects on the notebook won’t damage the screen. Also, the matte surface provides extra grip when carrying it around but it’s a fingerprint magnet at the same time. Frequent cleaning will be required. As far as the hinges go, they appear to be a bit too tight for our taste, although it’s way better this way than being too loose. Opening the laptop requires two hands but the good news is that no bouncing occurs while using the laptop. 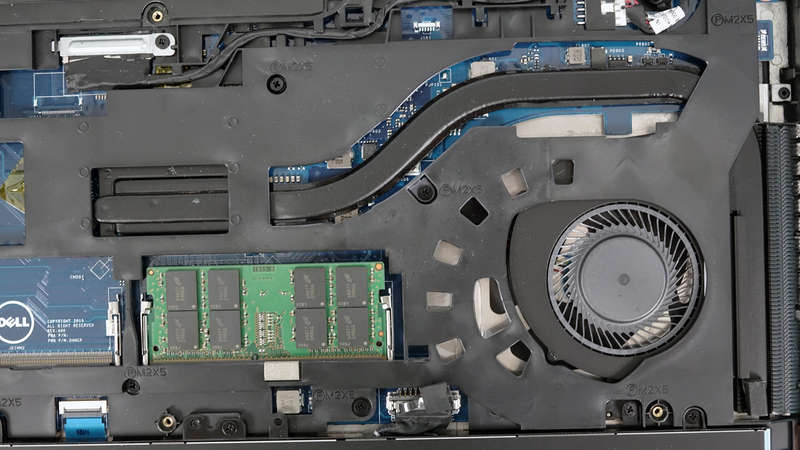 The bottom piece hasn’t gone through any changes as well – it’s basically a big maintenance hatch, which is easy to remove in order to reach the RAM chips, HDD and M.2 SSD slot. The sides offer the usual port setting and a good placement of the latter. 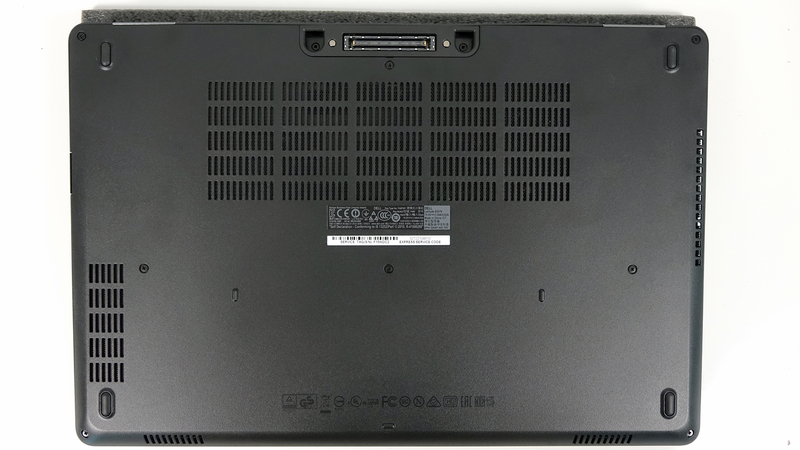 And typical for a Dell Latitude machine, the not so commonly used connectors are placed on the back – HDMI, VGA, LAN, and DC adapter. You will also find the SIM card tray if your model is 4G LTE-enabled. However, there’s also one USB 3.0 port that is better off on the left or right side but that’s just a minor inconvenience. Luckily, Dell has also put two more USB 3.0 ports on the right keeping company of the SD card reader, 3.5 mm audio jack. This leaves the left side only with the contracted smart card reader and the main exhaust vent for dispersing the heat. 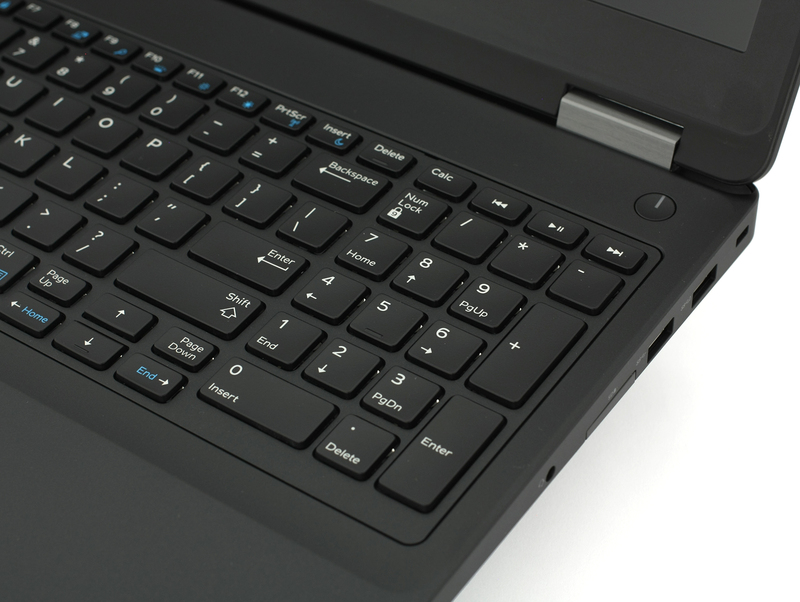 It’s easy to spot the identical interior coming from the E5550 – same keyboard, same trackstick, same touchpad. We don’t mean that in a bad way, though. We are extremely happy with the keyboard’s ergonomics offering long key travel, tactile feedback, and bright enough LED backlight. We can only say the same for the trackpad and mouse buttons – accurate, responsive and great surface to work with. The only thing that we didn’t like so much is the trackpoint. It feels a bit “mushy” and not sticking out enough to feel it over the keys. The same goes for its dedicated mouse buttons located below the space bar and the trackpad area. But if you are a fan of this input method, you will probably get used to it. And finally, the fingerprint reader has been revamped and now looks like an actual fingerprint scanner and it’s much easier to find in the dark compared to the old design on the E5550. All in all, the notebook offers good sturdiness, portability and doesn’t have any irregularities, gaps, holes or protruding edges. Frequent cleaning will get rid of the smudges on the lid and the hinges keep the display firmly in place. And as always, input methods are flawless – comfortable and easy to use. 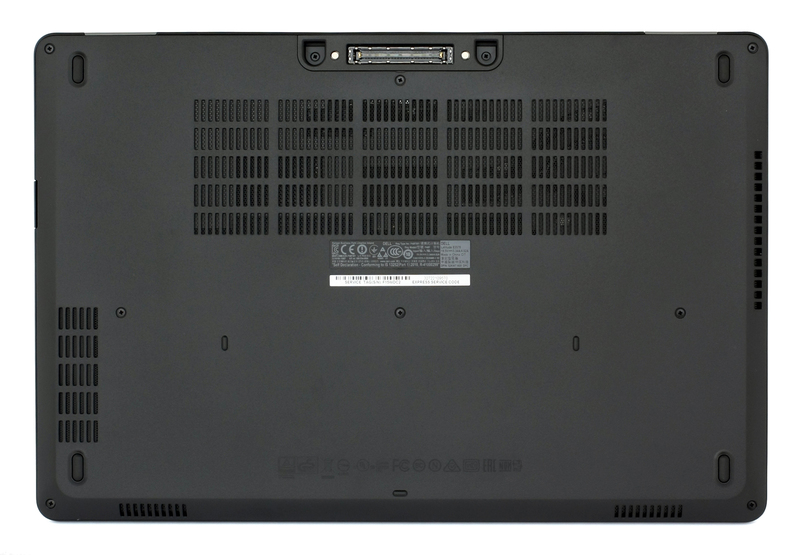 Most of the key selling points a business laptop should have, the Latitude E5570 delivers. The notebook doesn’t have a dedicated maintenance hatch but it’s still easy to remove the whole bottom piece to access all of the internals. Even the prying up part isn’t that hard at all. For storage, you will have to choose between a standard 2.5-inch drive or an M.2 SSD since one obstructs the other. Our unit came equipped with a Samsung PM871 SATA M.2 SATA SSD in a 2280 size and 256GB capacity. 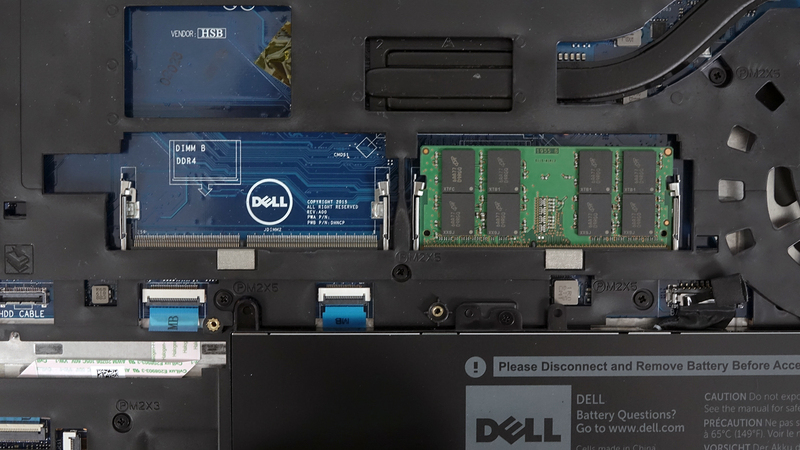 Some users claim that the notebook supports PCIe NVMe-enabled devices but you might also need to do some tweaking in the BIOS menu. You can look here for more information. 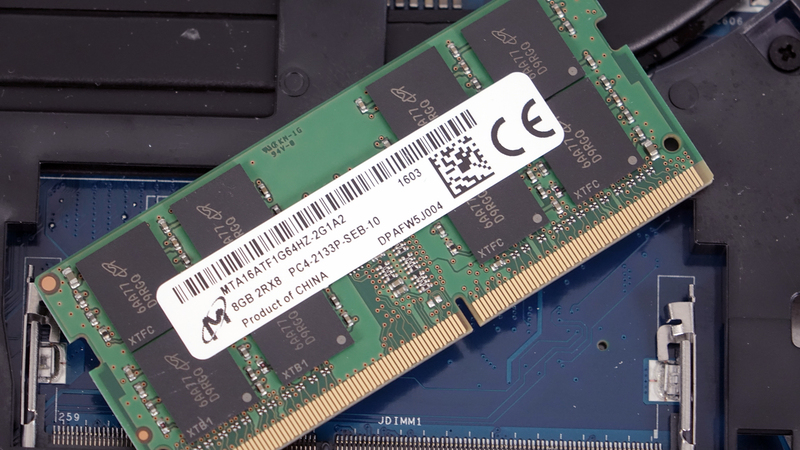 The motherboard of the notebook supports two DDR4-2133 RAM chips and if you go with the 8GB version, you will probably have only one of the slots taken. Our unit came with an 8GB Micron MTA16ATF1G64HZ-2G1 stick. There’s no need of further disassembly to access most of the replaceable hardware. 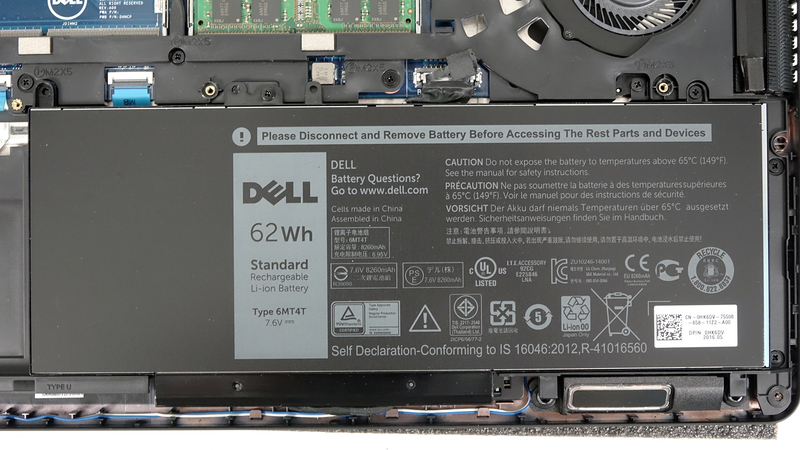 The battery unit is rated at 62Wh an takes a good chunk of the inside space. 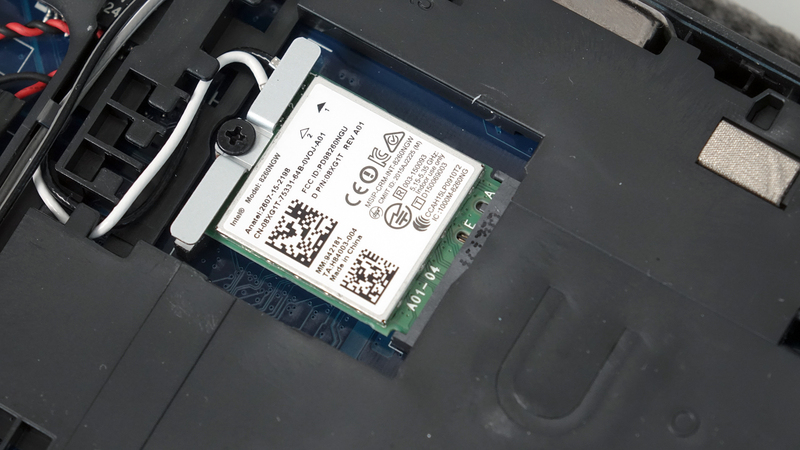 The Wi-Fi module is Intel-made with model number 8260NGW. The cooling system consists of only one big heat pipe going into the fan on the left side of the notebook. 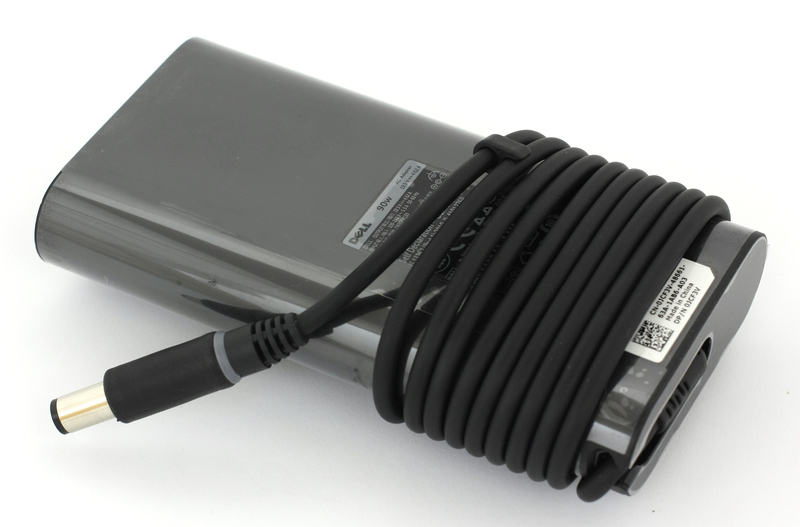 It should be sufficient enough to support the ULV processor (ultra-low voltage) even during high load. The new Latitude E5570 uses a different IPS panel than its predecessor now adopting Samsung-made display with model number SDC894F (C1J7M-156HL). The panel features Full HD (1920×1080) resolution in a 15.6-inch diagonal leading to a pixel density of 142 ppi and 0.18 x 0.18 mm pixel pitch. The screen can be considered as “Retina” when viewed from a distance equal or greater than 60 cm. Here’s how the display looks under a 45-degree viewing angle. We were able to record a maximum brightness of 336 cd/m2 in the middle of the screen and 320 cd/m2 as average value with a maximum deviation of 16%. The color temperature is 7400K and it’s relatively close to the standard 6500K. The contrast ratio is also good – 1300:1 (after calibration at 140 cd/m2 luminance). You can see in the image below that the maximum dE2000 color deviation is exactly 4.0 while keeping in mind that values above 4.0 are unwanted. 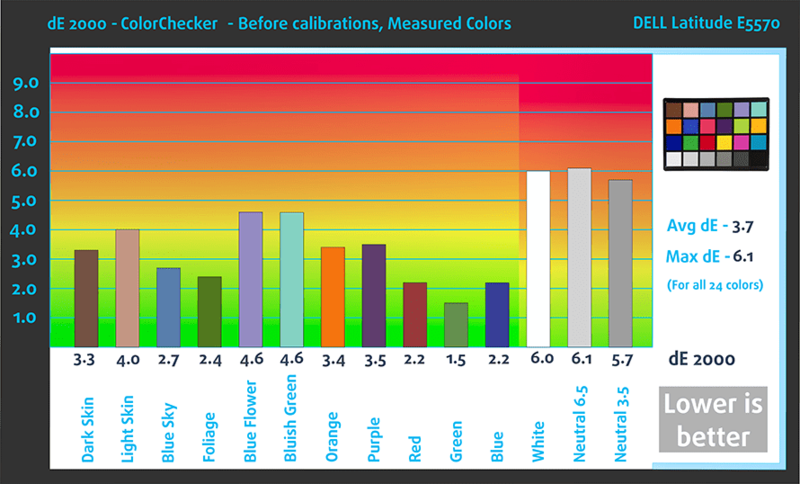 It’s an important test if you are looking for a display suitable for color-sensitive work. In this case, the display covers about 88% of the sRGB gamut, which is suitable for general multimedia, browsing and office work, which is the main purpose of the notebook anyway. 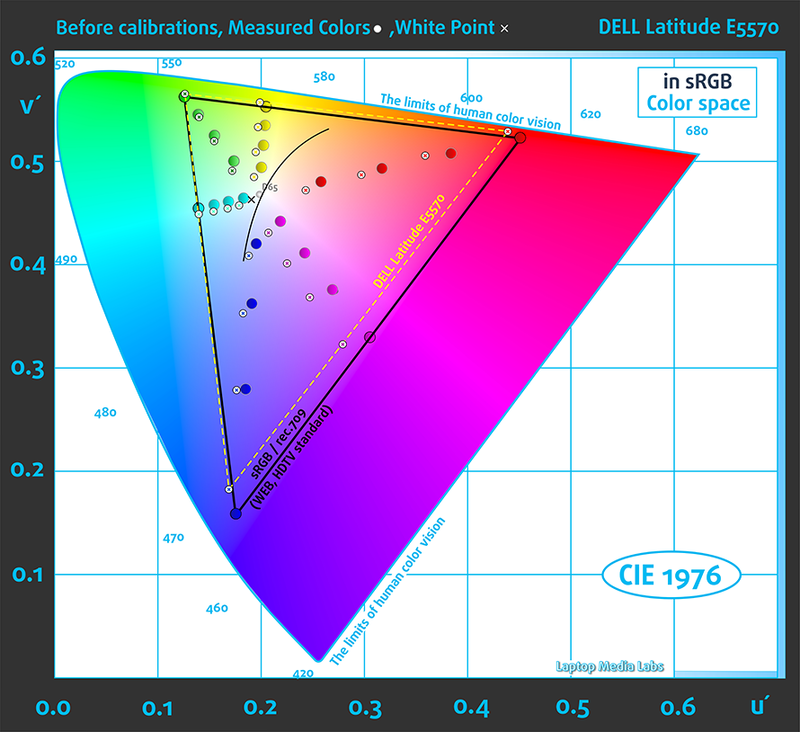 We’ve created the profile at 140 cd/m2, 6500K white point and sRGB mode. Fortunately, we didn’t detect any PWM across all brightness levels making the display suitable for users with sensitive eyes. With our Health-Guard profile installed, you can benefit from reduced blue light emissions. You can see the levels of emitted blue light on the spectral power distribution (SDP). But if any of this doesn’t make sense to you, we suggest reading our extensive article explaining the so-called blue light emissions and the SPD (http://laptopmedia.com/reviews/health-impact-of-display-blue-light-and-our-solutions-for-you/). The display at hand has little drawbacks that can be easily fixed by installing our profiles. For instance, the Latitude E5570 offers bright IPS panel with wide sRGB coverage, excellent contrast ratio and relatively accurate color reproduction out of the box. However, the slightly higher color temperature will increase the blue light emissions but here’s where our Health-Guard profile comes into play. Moreover, the Office/Design work profile brings down the average deltaE down to 1.2 indicating pretty accurate color reproduction. Still, there’s a noticeable backlight bleeding that can be easily seen on dark or black background near the bottom bezel. Some units may not have this, but ours did and the bleeding was way too obvious. The best thing about this display, though, is the absence of PWM across all brightness levels making it perfect for users with sensitive eyes or businessmen working in front of the screen around the clock. We’ve witnessed excellent sound quality on the stereo loudspeakers. The specs below is for the tested model only and may differ from yours. We used a brand new installation of Windows 10 (64-bit) for this review so if you wish to perform a clean install yourself as well, we suggest downloading the latest drivers from Dell’s official support page. 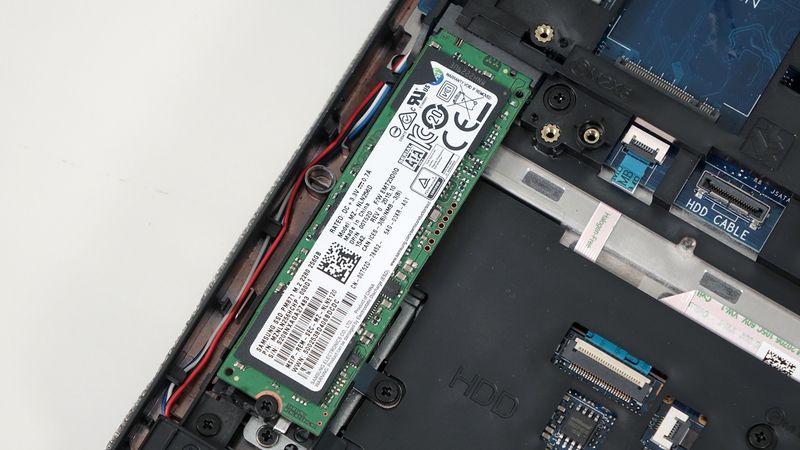 Since the Latitude E5570 holds a bigger battery than its E5550 predecessor, it’s normal to have an increased stamina but what surprised us is that the E5570 tops our battery performance list of all 15-inch notebooks we’ve tested so far. In fact, the laptop beats the likes of Acer TravelMate P658. Not only that but smaller devices like the ASUS ZenBook Flip UX360, Acer Aspire Switch Alpha 12 and HP Spectre 13 can’t hold up with the Latitude E5570. And all of this is possible due to the 62Wh battery and Core i5-6300U CPU on board. Of course, all tests were run using the same settings as always – Wi-Fi turned on, Windows battery saving feature turned on and screen brightness set to 120 cd/m2. Outstanding runtime – 553 minutes (9 hours and 13 minutes). Again an excellent result – 500 minutes (8 hours and 40 minutes). Intel’s Core i5-6300U is a ULV (ultra-low voltage) processor released during September 2015 but finds its way into notebooks later on. It’s basically an updated version of the Core i5-6200U with marginally better performance and adopting the so-called vPro technology, which in practice is an umbrella marketing term for a collection of features. The chip is manufactured by 14nm FinFET manufacturing process, it has two cores ticking at a maximum of 3.0 GHz or 2.9 GHz with two active cores while the base frequency is 2.4 GHz. The slightly improved clock rates promise better overall performance than the former Broadwell Core i7-5500U. The power consumption is 15W like the rest of the ULV CPUs and that includes the dual-channel DDR4-2133/DDR3L-1600 memory controller and the integrated GPU. 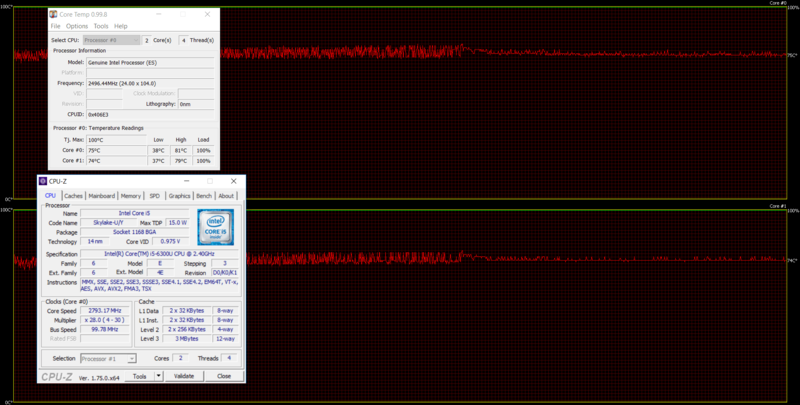 Speaking of which, it’s Intel HD Graphics 520 featuring 24 EUs (Execution Units) clocked at 300 – 1000 MHz. Moreover, the TDP can be configured by the manufacturer and can reach 7.5W. 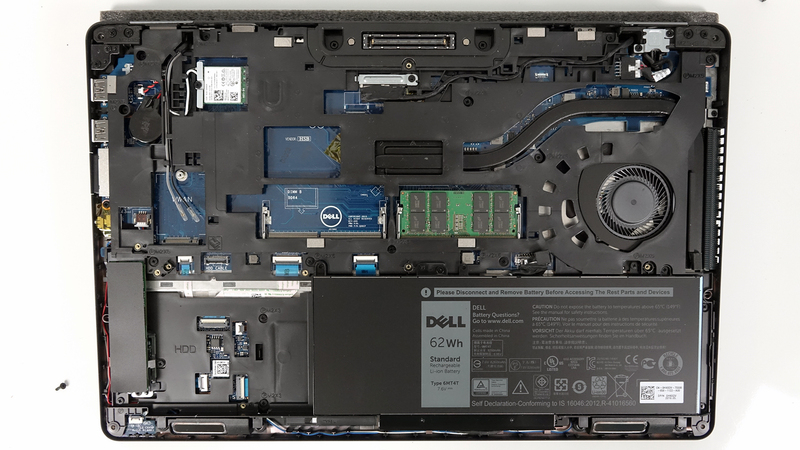 Here you can see an approximate comparison between the CPUs that can be found in the Dell Latitude 15 E5570 models on the market. 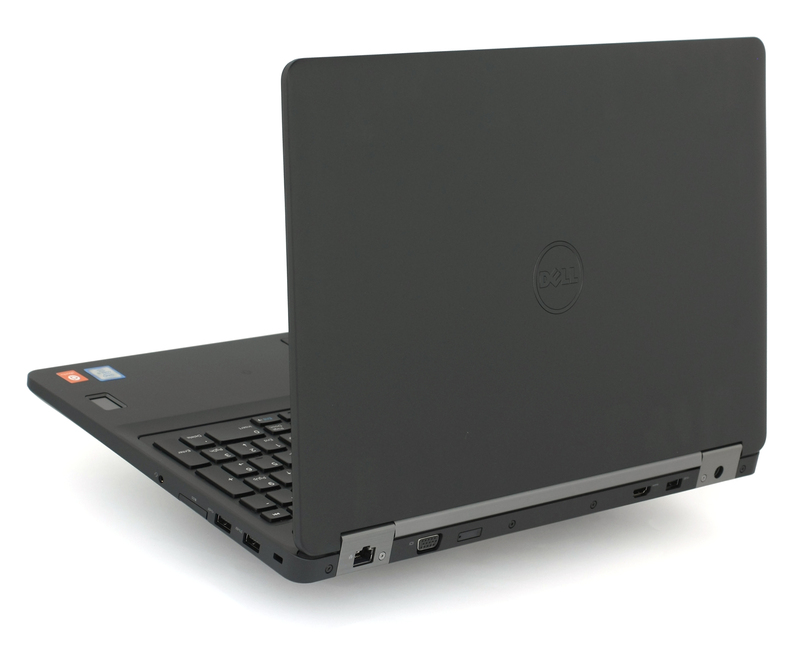 This way you can decide for yourself which Dell Latitude 15 E5570 model is the best bang for your buck. Fritz is a chess benchmark that tests the computing capabilities of the CPU with various chess moves. The Intel Core i5-6300U reached 5.679 million moves per second. By comparison, one of the most powerful chess computers ever, Deep(er) Blue, was able to squeeze out 200 million moves per second. In 1997 Deep(er) Blue even beat the famous Garry Kasparov with 3.5 to 2.5. As we’ve already said numerous times, the usual stress tests on the CPU and GPU aren’t a good representation of real-life use since the user won’t be able to reach 100% CPU and GPU load most of the times but, on the other hand, this two-staged test gives us a valuable insight of the cooling design and how the system will fare in the long run. We start off with a simple CPU stress test for about an hour. The system was able to utilize the full potential of all two cores of the Core i5-6300U CPU (2.8 GHz while the maximum boost frequency is 2.9 GHz for two active cores) and kept temperatures relatively high on the inside – 81 °C. 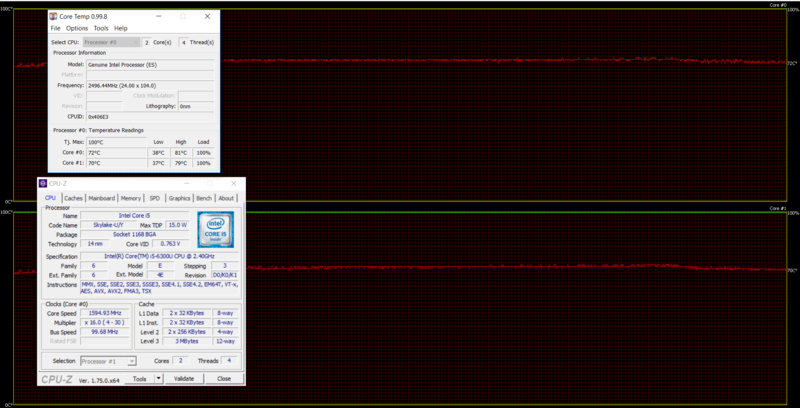 After we turned on the GPU stress test as well, the CPU was downclocked in order to give some headroom for the iGPU to perform while maintaining the same temperature as before – between 70 and 80 °C. And, of course, since the machine isn’t housing any demanding hardware, temperatures on the surface remained low without affecting the user’s experience. 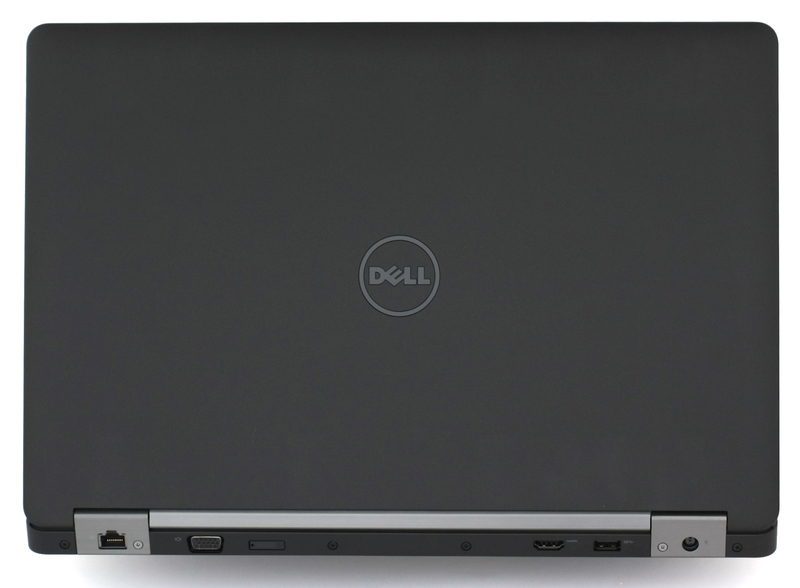 The Dell Latitude E5570 is an excellent business all-rounder leaving little room for improvement while offering even better hardware than its predecessor. In short – definitely worth the upgrade. 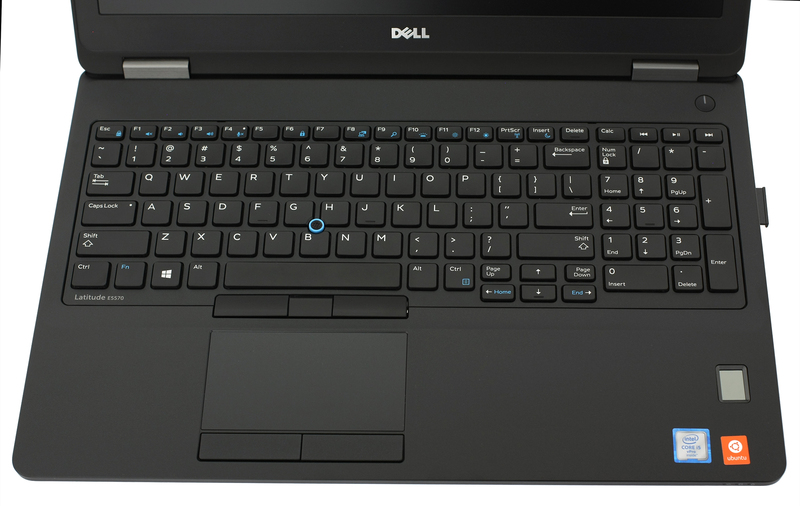 Nonetheless, Dell has kept the main key selling points of the notebook from the last generation – excellent build quality, low weight, thin profile, comfortable keyboard and good touchpad performance making it on par Acer’s alternative – the TravelMate P658. However, for roughly the same price, the TravelMate P658 offers a few extra features like USB-C (Gen 2), discrete GeForce 940M GPU – although this isn’t necessarily a drawback for a business machine – and much better storage options. While the Latitude makes you choose between an M.2 SATA/PCIe NVMe SSD or 2.5-inch HDD, Acer’s solution supports the M.2 + 2.5-inch combo or two M.2 SATA SSDs in RAID 0 configuration. But as far as battery life and screen quality are concerned, both machines appear to offer similar performance with the Latitude E5570 having a slight advantage. We are talking about 6% longer battery life and no PWM across all brightness levels of the screen. The latter is really important if you have sensitive eyes. At the end of the day, the Latitude E5570 is an excellent and reliable business solution that will fit most users on the go and thanks to the excellent IPS panel, it can be used for multimedia purposes for hours without the need of charging it or without causing any negative effects due to the lack of PWM.